While the Pascal GPUs may not seem as appealing now that the new Turing models have been unveiled, they are far from dead. 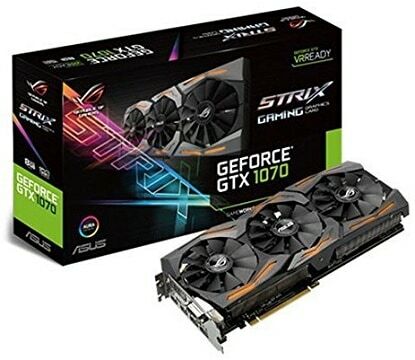 Indeed, even though the GTX 1070 itself already had an updated counterpart, the GTX 1070 Ti, long before the RTX cards rolled around, some will most certainly find the older version to be more appealing. Simply because it offers comparable performance at a noticeably lower price tag. And true enough, while both the GTX 1070 Ti and the RTX 2070 perform better, the good old GTX 1070 is now subject to many price cuts and discounts that ultimately make it more approachable than it has ever been before. Now, let’s take a look at the very best GTX 1070 models available at the moment, shall we? As usual, we’ll be starting this list small, with the GTX 1070 Mini ITX from Gigabyte. This is by far the smallest GTX 1070 model out there, making it great not only for Mini ITX cases but also for external GPU enclosures. 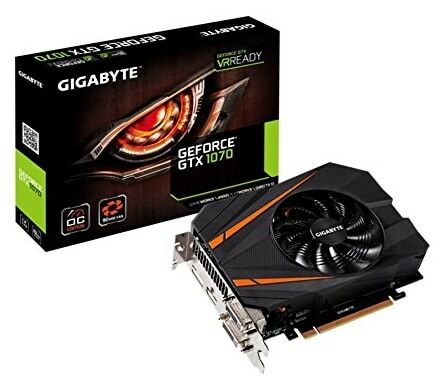 As a matter of fact, Gigabyte sells one of these with this very graphics card pre-installed. From a design standpoint, it is pretty much what you’d expect of a Gigabyte card – black plastic exterior with orange highlights and their unique fan design. Admittedly, it looks quite good, especially considering that manufacturers often cut some corners in the design department when it comes to “mini” cards. Now, the main advantage of the Gigabyte GTX 1070 Mini ITX is, of course, in the name, and it is its compactness. As mentioned in the introduction, it is the smallest GTX 1070 available, but while it uses the same excellent GPU as bigger and pricier models, it also has one inevitable shortcoming that comes with compact cards, and it’s the cooling. Namely, with only a single fan cooling this powerful GPU, the card is bound to get hot and loud. 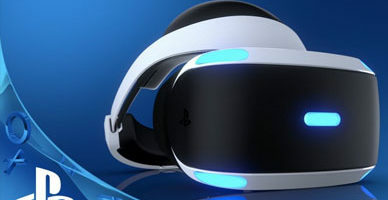 Needless to say, this also means that it won’t take any real overclocking, as the temperatures and noise levels are bound to get relatively high even with the stock clock speeds. With that in mind, we’d only recommend this model specifically to those seeking to build a Mini ITX gaming PC or those who intend on packing the card in an external GPU enclosure. Otherwise, we’d suggest going with one of the following models, as this particular model isn’t much cheaper than those which have more to offer in regard to performance. 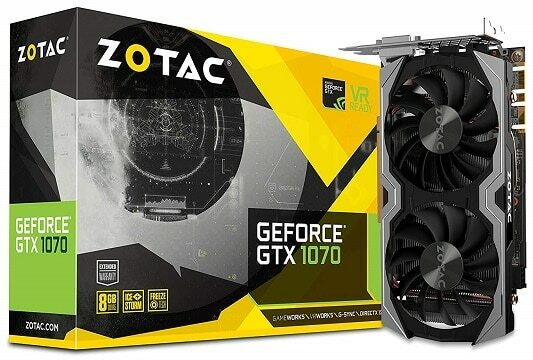 Next up, we have a Zotac GTX 1070 Mini, another compact version of this great GPU, albeit one that has more to offer when it comes to performance. Sure enough, thanks to the bulkier heatsink and due to utilizing dual-fan cooling, this Zotac card manages to one-up the above Gigabyte model. Design-wise, the GTX 1070 Mini comes with a simple black and silver exterior, making for a minimal and inconspicuous design that is bound to fit in well with most builds. As with the previous GTX 1070 from Gigabyte, the primary advantage and key selling point of the Zotac GTX 1070 Mini is its ability to fit into the more compact computer cases easily. True, the Zotac model is a bit larger due to implementing a bigger heatsink and two fans, but it can still fit inside a Mini ITX case. 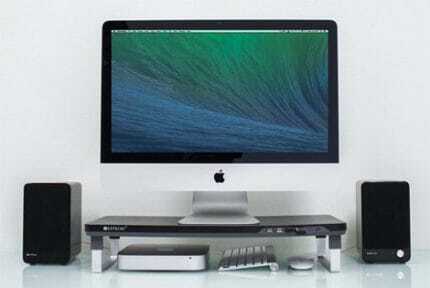 More importantly, it will run more quietly and at lower temperatures thanks to the dual-fan cooling. Now, it is also worth noting that it shares a similar price point with the above Gigabyte GTX 1070, so the same applies – it is not a particularly good investment unless you’re building a small form factor gaming PC. 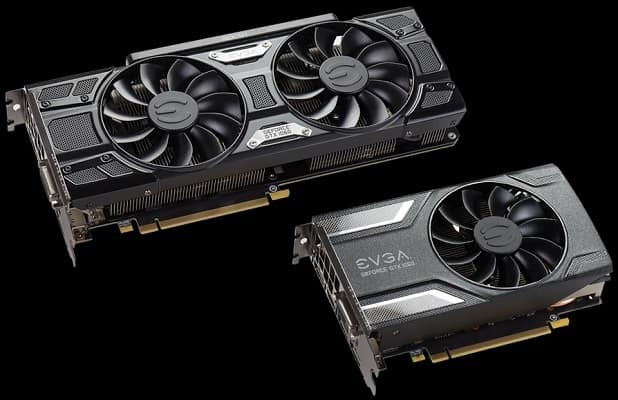 Now that we’re done with the two compact variants, it’s time to look to the more serious solutions, and what better card to start with than with one coming from EVGA – the EVGA GeForce GTX 1070 SC GAMING. This full-sized card is cooled by two powerful ACX 3.0 fans and sports the sleek and recognizable design that this company is known for. Overall, it is a very well-rounded card that manages to blend performance and design in a single modestly-priced package. If it’s value you’re looking for, you can’t do much better than this card. It sports a quality build becoming of a high-end GPU, offers great stock clock speeds and solid overclocking performance, all the while being quite affordable at the moment, as far as GTX 1070 models go. In addition to that, it also has white LED lighting and a backplate, both of which contribute to its aesthetic appeal. Now, considering just how cheap this card is at the moment, we’d be really hard-pressed to find anything bad to say about it that doesn’t seem overly nitpicky. The next graphics card we have lined up comes from MSI, and it belongs to their enthusiast-oriented Gaming X series – the MSI Gaming X GeForce GTX 1070. That said, the card sports two massive Torx 2.0 fans and fares better when it comes to overclocking than the above EVGA model. The card boasts the staple MSI Gaming design – plenty of red highlights, heavily detailed, sporting the signature dragon logo in the center of each fan, and it even comes with customizable RGB lighting, all of which cement its identity as a gaming graphics card. 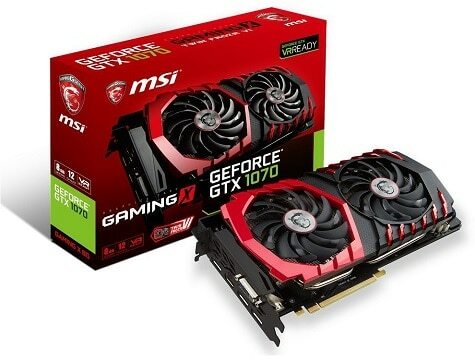 With great cooling and some of the best performance that a GTX 1070 has to offer, combined with the quality build and RGB lighting, the MSI Gaming X GTX 1070 is a great buy that is bound to fit the bill for any enthusiast who is looking to get an excellent GPU at a bargain. There are two drawbacks to this model though, and it’s the pricing and the design. 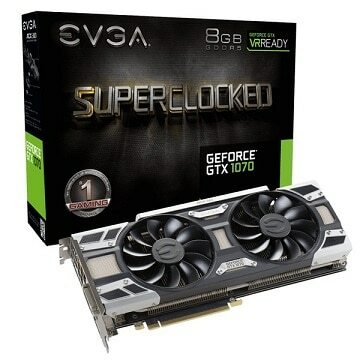 It costs a fair bit more than the above-described EVGA card at the moment, even though the performance increase is far from proportionate to the price increase. On top of that, many will agree that the design is quite gaudy and over-the-top, so it won’t fit very well with some setups. And for the final entry, we have a graphics card made by a company that definitely needs to introduction – Asus. The model in question belongs to their well-known Republic of Gamers brand, and with that in mind, it’s fairly obvious what kind of product you can expect this card to be. Coming with a total of three fans and a massive heatsink, you can be sure that the card is capable of taking some serious overclocking, and it doesn’t fall short in the aesthetics department either. The exterior itself is made of black plastic, complemented by a sleek metal backplate and, of course, RGB lighting that extends to the stripes on the front and the large RoG logo located on the backplate. With all of the above in mind, it is fairly obvious who this card is meant for. There is simply no denying that it excels on every front, but as is usually the case with high-quality products, the price is high as well. Our main issue with this card is precisely its pricing, as it is clearly more expensive than the competition right now. 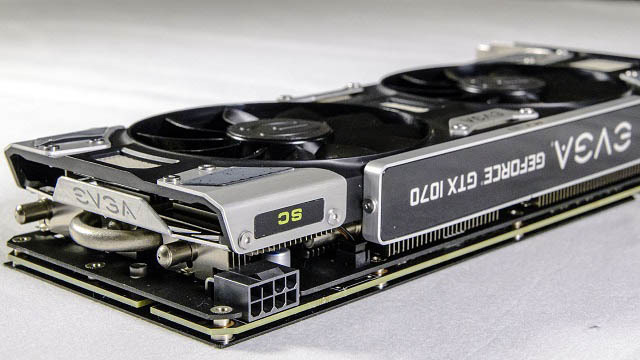 Some might find the overall build quality, the RGB lighting, and the card’s overclocking potential well-worth the price, but with the RTX 2070 in the equation, the value of this particular card is made all the more dubious. And now that we’ve covered several of the best GTX 1070 models available, it’s time to take a closer look at what features you should look out for when deciding on which model fits your needs best. The cards included on this list all use open-air cooling, but what differs is the number of fans that the card uses: one, two, or three. So, what are the advantages and disadvantages of each variant? The main advantages of single-fan cards are the fact that they tend to cost less and, more importantly, that they are more compact than the models with more fans. But while this makes them good for gamers who are looking to spend as little as possible, as well as those who intend on building a Mini ITX gaming PC, these cards are sorely lacking when it comes to performance. Since they rely on only one fan, they get loud, hot, and are thus not very good for overclocking. Dual-fan and triple-fan variants are more performance-oriented since the multiple fans and the larger heatsink both contribute to improving heat dissipation. So, not only do multiple fans make the card quieter and cooler, but they also allow it to perform better through overclocking. Triple-fan cards will obviously outdo dual-fan cards when it comes to sheer cooling efficiency, but with three fans and a massive heatsink, those cards can hardly be called compact and it takes a spacious case to house them. Backplate – What Does It Do and Do You Need It? You’ll notice that we mentioned backplates a few times here, so what’s the deal with them? Well, backplates are generally little more than a fashion detail for graphics cards, usually reserved for high-end and some mid-range models. To put it bluntly, they are mostly there for show, helping provide a cleaner look by obscuring the PCB from view. And while they can sometimes help with heat dissipation, any advantage that a backplate can offer in regards to cooling is marginal at best. As such, if you’re building an open rig or will simply be going with a transparent case, getting a card with a backplate will contribute to the aesthetics of your build. If you don’t care about aesthetics, then you can put the backplate out of your mind completely. As you probably know, there are three interfaces used by graphics cards and displays today: HDMI, DisplayPort, and DVI. Sometimes, you can even see VGA still hanging around, but it only remains popular in the low-end due to its limitations. Now, when choosing which port to use, the chief factors to consider are the maximum supported resolution and the maximum supported refresh rate in your resolution of choice. 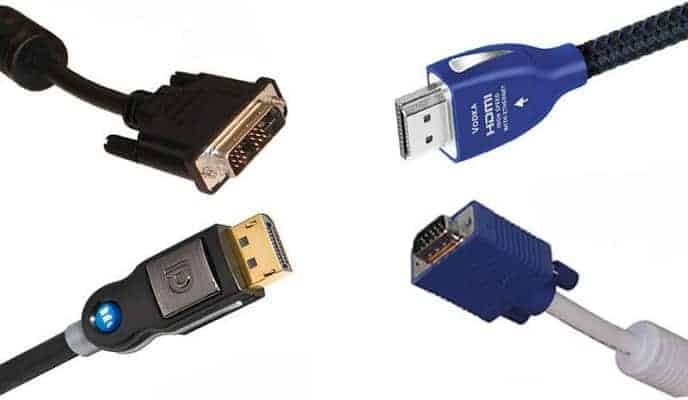 HDMI 2.0, one of the newer versions of HDMI that all of the cards listed here use, supports 4K with a refresh rate of 60 Hz, while it can go up to 120 Hz in 1080p and 1440p. DisplayPort 1.4 can do more, though, as it can push 120 Hz in 4K, all the while supporting 240 Hz refresh rates in both 1080p and 1440p. As for Dual-Link DVI-D, its maximum resolution is 1440p, and the highest supported refresh rate in this resolution is 60 Hz. It can, however, do 144 Hz in 1080p, so it is still a viable choice for some builds. When everything is said and done, which model would be our top choice? Well, we would have to go with the EVGA GTX 1070 SC Gaming. As far as we’re concerned, this particular model presents the best overall value for your money. It performs admirably, is well-built, and is fairly affordable compared to the competition. It goes without saying that either of the first two models would be a better choice for smaller cases, while the last two MSI or Asus variants are better suited for those who are willing to invest a bit more and get a card that they can squeeze some extra performance out of with overclocking.